Saturday, July 6 Starting at 6:00 pm Riverloop Amphitheatre Enjoy live music by Waterloo Cedar Falls Symphony & Brazilian 2wins. Food & beverages will be available for purchase. Fiesta! 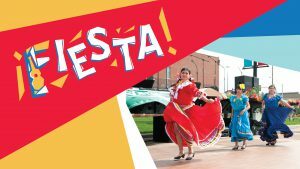 A Celebration of Latino Heritage July 13, 2019 Saturday, 5:30-9:30pm RiverLoop Amphitheatre Free admission Celebrate with live music & entertainment and kids' bounce houses and activities! Food & beverages available for purchase. Presented in partnership with Veridian Credit Union and LULAC (League of United Latin American Citizens). July 19 - The Greatest Showman (sing-along edition) Gates open at 8pm, movie starts at 9pm or sunset Free admission Catch movies downtown this summer at the RiverLoop Amphitheatre! Popcorn, snacks & beverages available for purchase. Featured Band: Jimi "Prime Time" Smith (Electric Guitar/Blues) Enjoy free live music at the RiverLoop Amphitheatre, downtown Waterloo. Food & beverages available for purchase. Sponsored by Community Bank & Trust. Featured Band: Avey/Grouws Band (Blues) Enjoy free live music at the RiverLoop Amphitheatre, downtown Waterloo. Food & beverages available for purchase. Sponsored by Community Bank & Trust. August 17 - Spider-Man: Into the Spider-Verse Gates open at 8pm, movie starts at 9pm or sunset Free admission Catch movies downtown this summer at the RiverLoop Amphitheatre! Popcorn, snacks & beverages available for purchase. Featured Band: Galactic Cowboy Orchestra (bluegrass/rock/jazz fusion) Enjoy free live music at the RiverLoop Amphitheatre, downtown Waterloo. Food & beverages available for purchase. Sponsored by Community Bank & Trust.